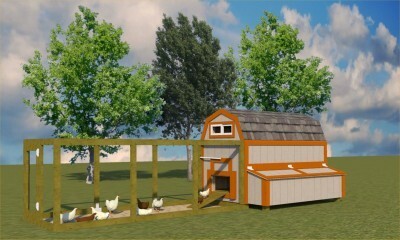 Build a nice home for your chickens with these chicken coop plans. Not only are they easy to use and understand but your purchase also comes with full email support from John, webmaster of shedking and developer of these neat hen houses. This chicken coop has a barn style roof giving your chickens plenty of roosting room. Your happy chickens will also get a 4'x12' chicken pen, egg laying area with access lid, and you will have an access door to get in for cleaning. etc. Learn more about this coop. I will be working on more chicken coop building plans. If you have a special request, send me a picture attached to your email, and I'll see what I can do for you.